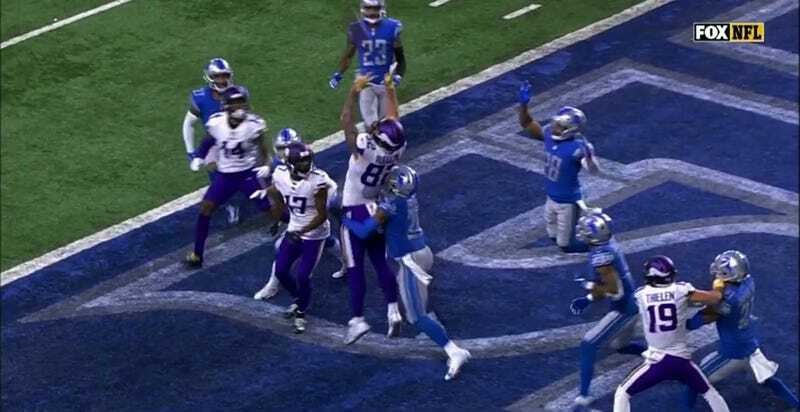 Stop me if you’ve heard this before: with time expiring, the Detroit Lions were unable to prevent a division rival from successfully pulling off a Hail Mary throw. That’s right, it happened again with the Vikings. Kirk Cousins threw a 44-yard bomb to Kyle Rudolph—who was rather uncovered in the end zone—to end the first half with a touchdown, and a 14-9 lead. Not even having Kenny Golladay in the end zone as a safety could prevent this from happening. The stakes obviously weren’t as high as when Aaron Rodgers pulled this off for a walk-off touchdown three seasons ago, and the pass didn’t have to go as far, but the fact that not even a coaching change can prevent Detroit from allowing this kind of play (on the same side of the end zone, no less) is emblematic of the cursed, sad state of the franchise. The Vikings had five—count ‘em, five—yards of total offense with four minutes left in the half, and they went into the break ahead somehow.